We are using HP Enterprise Cloud’s nodes. Sometimes we use Rackspace’s Cloud Server or Bare Metal. XCache possible gives pathetic result on cheaper hardware. If you use $7 / month 6GB VPSDime or a cheaper dedicated server, method of caching will be different. If you do not find any part on our website, you should read guides by Rackspace or Major Hayden. Basically W3 Total Cache plugin serves Static HTML pages. W3 Total Cache is enough to handle all the caches. If you cache those Static HTML pages with Nginx Microcache, then you’ll need their WordPress Plugin. Do not copy-paste from here and there without understanding. If you follow our plus WordPress DOT ORG’s codex.wordpress.org guides and settings; you will not face any trouble. Nginx Microcache is not shown to enable in this guide. You have a basic idea of how to SSH. If you are even newer user, read our older guides on Rackspace Cloud Server series to get used. Nginx is not exactly for the newbies. It is better to have an idea of using typical LAMP servers. We are installing Nginx Web server software, Percona MySQL database server, Memcache on same server. MySQL database server can be installed on different server. We recommand to use ONE server for all if you are a new user. We are assuming that the user is using an instance with 4 GB RAM or more. We have some kind of configured settings files on Github. They are deliberately not 100% closer to our real settings, but very closer. Basically we have optimized settings files. We simply run the commands and copy-paste them. When you’ll reach your optimized settings by tuning, keep the files on some free cloud storage like Dropbox or at minimum on your computer. Often, we may need to change host or server. We prefer to install database software first. Percona MySQL is preferred as Percona has free tuning service. Only settings files is my.cnf. You can optimize it later using Percona’s service and Major Hayden’s MySQL Tuner. We prefer InnoDB engine. We were talking about optimizing this file. You can optimize it later like using some basic tweaked and ready to my.cnf from our GitHub repo. That /etc/mysql/my.cnfcreated after running the sudo mysql_install_dbcommand. Percona has no my.cnf by default. Percona MySQL is for the advanced users. We have finished installing MySQL database part. You can scroll to proceed to next section or go to the top to Table of Content. We have configuration flies kept here on GitHub, you can use them later. However, it uses TCP/IP, you should modify fastcgi_pass 127.0.0.1:9000; to fastcgi_pass unix:/var/run/php5-fpm.sock;, if you use that file. We like UNIX Socket over TCP/IP. Nginx Plus is the paid, optimized version of Nginx community edition. It is very light and Nginx directly optimize by login in to the service. If you need Nginx Plus, you can contact us. Directly Russian team of Nginx contact you via email. Installation and configuration of Nginx Plus is different. We have finished installing MySQL database and Nginx web server. You can scroll to proceed to next section or go to the top to Table of Content. We installed XCache, Memcached and the PHP5-Memcache which is compatible with WordPress W3 Total Cache plugin. WordPress W3 Total Cache plugin’s developer is a great person. Our older guide’s link is listed on official readme text of the Plugin. You are installing in the way, WordPress W3 Total Cache plugin will work without hitch. Else, we can not use locate command to find the files. Modify the memory to -m 1024. By default, its to less. Initially edit the first result before installing WordPress – file name is usually 20-xcache.ini. We have ready to use configuration file on GitHub. Username and Password not set. XCache is discussed separately and must be read. XCache need another work – setup of XCache Admin page. XCache is very powerful caching system. Memcached is not alternative to XCache and vice-versa. Paste as content of index.php. Now, go to you IP address (or domain name) via browser. You should see an informative page about PHP. If you see white page with or without any text, you are getting error. Try to fix PHP5-FPM in this way first. Running service php5-fpm restart twice excludes the probability of loading a wrong PHP settings. Another thing you need to change – Expiry header from 19 Nov 1981. Run locate php.ini, you’ll see first two php.ini files. Change only those two. They are so dangerous, that it is not even safe to add only password to protect. When we restart Nginx, a hacker can intrude & run an exploit. They are for dev purpose. It is safe to keep “outside of public sight”. Setup of XCache Admin page is discussed before. XCache Admin is robust about security. It is not unsafe to keep it on public directory. We have finished installing MySQL database, Nginx web server and PHP. You can scroll to proceed to next section or go to the top to Table of Content. Most easy step. We suggest to add the IP to your favorite DNS Service, like CloudFlare or DynDNS. If your domain name is abhishekghosh.net and IP yo.ur.IP.add.ress, you should wait for few minutes to make DNS Service to force using the domain name. mv * .. && cd .. Paste the content in the file. Now, go to you IP address (or domain name) via browser and complete WordPress installation. It is too basic configuration for WordPress and server side caching. WordPress DOT ORG has good documentation at codex.wordpress.org for Nginx configuration for WordPress W3 Total Cache. WordPress SEO will need some configuration as well – it is only few lines. Directly use the snippet on either nginx.conf or default virtual hosts file. This is a professional grade WordPress installation with no basic security part. This WordPress can not send email to you. So, you’ll need Mandrill and our snippet or any other cloud transactional email to make WordPress installation near perfect. WordPress typically throw some odd errors. You should change XML-RPC stuffs to prevent XML-RPC attack. Still, you may not be able to write from WordPress post editor. If such happens, fix by adding a line on wp-config.php file. If you need, only then you’ll do these steps. Make it habit to check free memory by running free command, check processes by running top command, analyzing the log files etc. Analyzing these all, actually tells us whether we are under attack or not. Networking attacks are eliminated by the good web hosts fully manually before it reaches us. As it needs manpower, the cost of server increases. If you use $7 / month 6GB VPSDime, it is likely to be under attacks. Minimum using Linode, Aruba Cloud etc. are safer. VPSDime is great for many other works – running smaller websites, taking backup of all the other servers etc. However, you must use free DropBox cloud integrated with server to push whole FTP and MyQL backup as tar ball at least every 3 days. Last but not the least – you need a CDN. You can use KeyCDN or CacheFly. There are dynamic website caching services from various service providers including Akamai. If you use them, need no optimization on your server – even no W3 Total Cache. We suggest to use either the full service of Akamai or CacheFly or DynDNS plus CloudFlare for maximum acceleration from DNS to PHP stuffs. Using Akamai’s all services makes our website to load within 3 seconds on webpage test test with 6 Ad units. The art of hand typed commands for installation and optimization of website is closer to death and only needed for cost saving purpose. We have finished Nginx WordPress Installation Guide. Nothing to scroll to proceed to read more on this guide! Go to the top to Table of Content. This Article Has Been Shared 4506 Times! Here are some special HHVM Wordpress (Nginx Ubuntu Server) Tweaks for Page Speed optimization, Compatibility of WordPress Themes and Plugins. Setup own URL Shortening Service for Websites on Rackspace Cloud within fraction of a minute using Free Google Apps Labs Short Links service. Cloud Computing Disaster Recovery Cheat Sheet for WordPress presents the clever ways to make the hacker fool and get your website back within few minutes. Competition in cloud computing is making the IaaS and PaaS to grow together. PaaS is almost by all the providers has a good free usage quota. This is a plus. 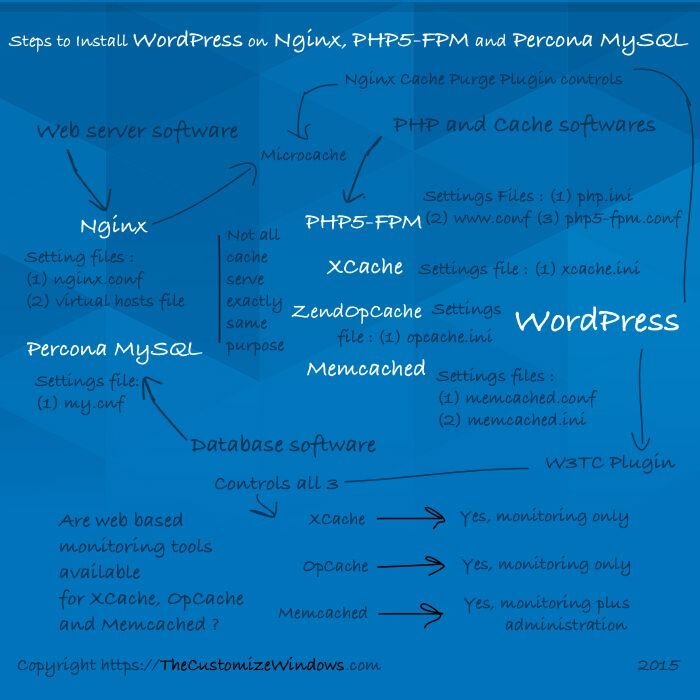 Cite this article as: Abhishek Ghosh, "Nginx WordPress Installation Guide (All Steps)," in The Customize Windows, December 17, 2015, April 21, 2019, https://thecustomizewindows.com/2015/12/nginx-wordpress-installation-guide-steps/.